Before your site goes live it is a good idea to commission a user experience survey. This can be done by family or friends and can give the owner valuable accessability and usability issues before the site goes live. Many html editors offer spellcheckers built into the software but these are seldom used. Also , many websites offer free link checkers to ensure your site is fully functional. Sales can be lost due to bad planning, incorrect links and difficult navigation. So what's the problem with having the odd typo on your website? Research conducted by Dr BJ Fogg and his team at Stanford University identified perfect spelling as one of the top ten factors affecting the credibility of a website. In a study of over 4,500 people they found that 'typographical errors and broken links hurt a site's credibility more than most people imagine'. 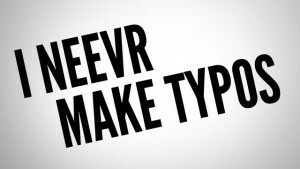 Websites have typos despite spell checkers in word processors and content management systems. Spelling errors crop up despite copy being reviewed. So if you want to help keep your website credible, you need to tackle the typos that get published.